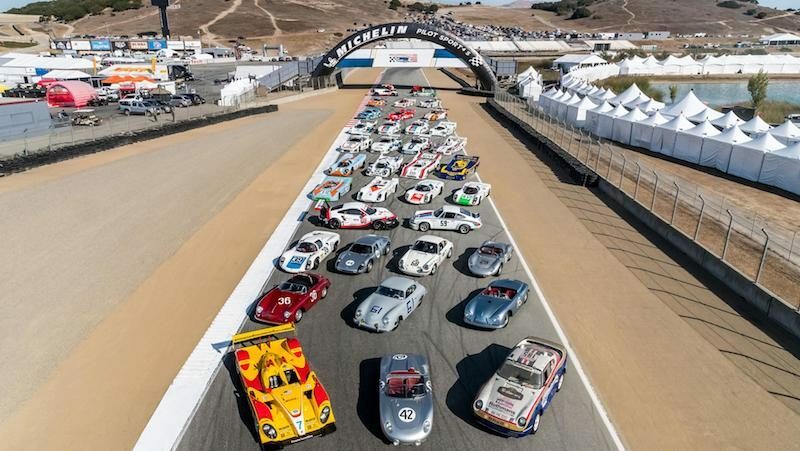 Thirty-eight historic Porsches graced the straight at Laguna Seca for the Rennsport VI family photo. Thirty-six cars, and two Porsche tractors. The presence of any one of these cars at a normal event would be noteworthy. If any one row of the included cars arrived at most events, it'd be the talk of the show. Perhaps that speaks to just how special Rennsport really is. The collection of Porsche racing cars on hand simply boggles the mind. Just watching the cars get into position is a feast for the eyes; some circle the track to join the queue, some are towed into place, and all are positioned to perfection by event staff. Of course, the action at this year's Rennsport is not all about Porsche racing cars. Porsche tractors are also getting a race at Rennsport VI, and two are featured in the family photo. In the absence of the legendary 917 "Pink Pig" one of the Porsche Diesels wears an adjustable aluminum rear wing and Pink Pig livery. The scheme is extremely appropriate, as the tractor is likely more intimately familiar with das schweine than the racecar ever was. With 38 vehicles on hand, there is likely something in the photo for every Porsche fan. Which absent cars would you like to see in the lineup?